While you can get excellent entry-level Chenin Blanc, Sauvignon Blanc at the same price is usually pretty bland stuff and if you want some excitement from the latter variety you have to be prepared to drop some cash. 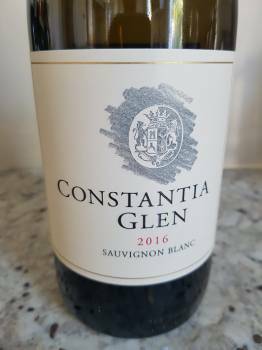 The Constantia Glen 2016 is R150 a bottle but is well worth the money. The 2016 vintage was exceptionally hot and dry but this apparently played in Constantia Glen’s favour – less vegetative growth in the vineyard and smaller berries with more concentrated flavour. Including 5% unwooded Semillon, the nose displays subtle notes of white flowers, fynbos, fresh herbs, talcum powder, pear and white peach. The palate has a pleasant austerity about it – pure fruit and bright acidity before a bone-dry finish. Very classy.